Only twice in the last hundred years has the Oregon legislature successfully completed redistricting without intervention by the secretary of state or the courts. For decades, the legislature failed to redistrict at all, so that the party in power could maintain its advantage, resulting in growing distortions in the ratio of voters-to-representatives from one legislative district to the next as population sizes shifted throughout the state. Oregon law requires that district lines are not to be drawn for partisan advantage, so partisan data is not analyzed publicly. But in reality, legislators share this data behind closed doors, and are well aware of how various options will affect party advantage. the hands of the legislature and into the hands of an independent commission. 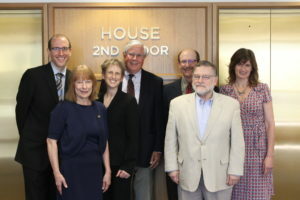 Recent Progress – Common Cause and the Oregon Redistricting Matters Coalition passed legislation in 2015 to increase transparency and public input in the state redistricting process. This is set to go into effect for the upcoming 2021 redrawing of political districts. 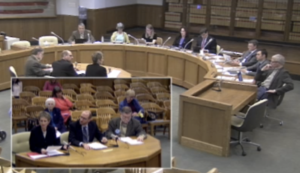 Below: Common Cause Oregon Director and coalition partners testifying at 2015 Oregon Legislature Hearing.